MyVillage™ Winter Sports/Forest Scene Backdrop from the range of scenic accessories fully compliments the Lemax Collection. 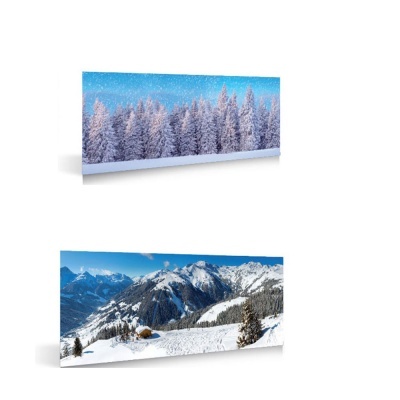 MyVillage™ Winter Sports & Forest plastic backdrop poster set depicts a snowed alpine Winter scene designed to compliment a Lemax Winter Village display. Reversible backdrop is made of flexible yet sturdy plastic to last, and designed to be used individually or joined to more to make a continuous wider backdrop. Ideal for placing behind a Lemax Winter scene, to create even more realism at eye level. This single piece double sided backdrop comes with choice of two different winter scenes on each facing.